NEUSPEED G60 Upgrade Kit VOLKSWAGEN - Pann Auto Performance - San Diego largest aftermarket automotive performance parts - What do you drive? Increase the horsepower of your Corrado G60 with the NEUSPEED HP II kit by increasing the boost pressure (to 15psi) and improving fuel delivery. 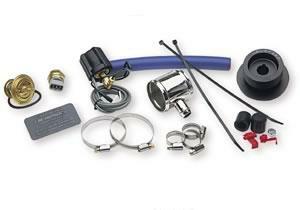 The NEUSPEED kit includes a smaller supercharger pulley, 180 degree water thermostat and fan switch, a boost-sensing pressure switch, and a stainless intake t-fitting to re-route the idle stabilizer valve valve back through the intake tract. If you purchased the original NEUSPEED HP kit years ago, or are using another manufacturer’s supercharger pulley without a fuel system upgrade, this kit is for you. It includes a boost-sensing pressure switch that enriches the fuel mixture at part-throttle settings. In contrast, the factory system can only accomplish this during wide open throttle. Our stainless intake T-fitting re-routes the idle stabilizer valve back through the intake tract to prevent the 2psi boost loss seen in the factory system.